My wife and I recently went on a drive to Hamilton Ontario to go shopping and also to my favorite restaurant to get some delicious chicken shawarma. I’ve been visiting this place for ten years now and I have ordered the same thing every single time. Every other place I’ve gone to makes a good shawarma, but this place is by far the best I’ve ever had. There’s just something about this dish that makes it such a perfect meal. The perfectly spiced chicken, the massive amount of sauce they use, the onion bits that are cooked just long enough to still be crunchy, and the lettuce and tomatoes with just a hint of vinegar. Add all that together and put it in a pita and you can never go wrong. That night, we went to see the Avengers movie. 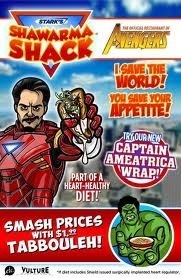 Towards the end, Iron Man (Robert Downey Jr.) asks Captain America (Chris Evans) if he has ever had shawarma before, and that he has never had it but would like to try it. Immediately my wife and I began laughing at the weird coincidence that we had just eaten some shawarma ourselves. As in most Marvel Movies, they added a few minutes of footage after the end credits. Usually it’s useful info leading into a future film or at least something that gets you thinking about what’s gonna happen next. Not this time though. 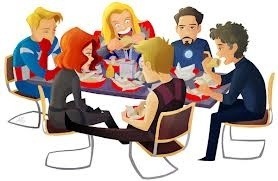 It’s just 40 seconds or so of the Avengers sitting at a table in a thrashed up Lebonese restaurant while mowing down on shawarma. Not a single word is uttered, just chewing. 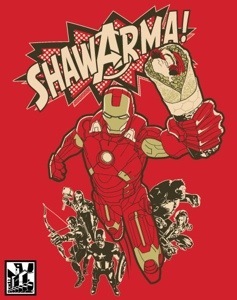 I have no idea why they decided to reference shawarma the way they did, or why they ended the film that way, but it was pure genius. I felt as though if I were a film maker, it’s how I would have added my favorite food into a movie for no other reason than to persuade people to go out and try it for themselves. 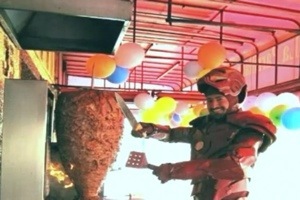 I have chosen not to add a link to a recipe for shawarma because there are to many different ways to make one. They are all good, but the only way to try the best is to go to Safin Grill on Mall Road in Hamilton Ontario. It will change your life. Since then, my wife made a homemade shawarma recipe and we plan to keep tweaking it and getting it as close to our favorite as we can. I can honestly say its the second best shawarma I’ve ever had. The key is in the sauce. The more the better. Once we feel we have reached our goal of shawarma perfection, we will post the recipe for all to enjoy. 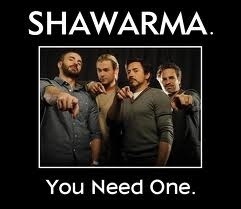 Until then, please visit your local shawarma restaurant and enjoy the goodness. If you live in or near Hamilton, good for you. Have to go visit Hamilton soon.